Today it is seven years ago that the Football School Tarrafal opened his doors. It was the first activity of Delta Cultura. Proud we look back on seven successfull years in which we run the Football School permanantly and besides others built the Child- and Youth Center Tarrafal and founded two Batuku Groups. 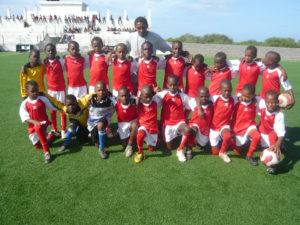 To celebrate the jubilee Delta Cultura organises a football tournament for the ages U10, U12 and U14. There will be teams from Tarrafal, Chao Bom and Calheta participating. This entry was posted in Uncategorized, What we do and tagged Child and Youthcenter, Football School Tarrafal, football tournament, Junior football, U10, U12, U14. Bookmark the permalink.